Walker’s have done it again: create a range of brand new Limited Edition flavours just in time for the World Cup Football Qualifiers. And what would this series be without them? We discovered 8 flavours at the Oxford Service Station and we’ll give you a rundown of them all. 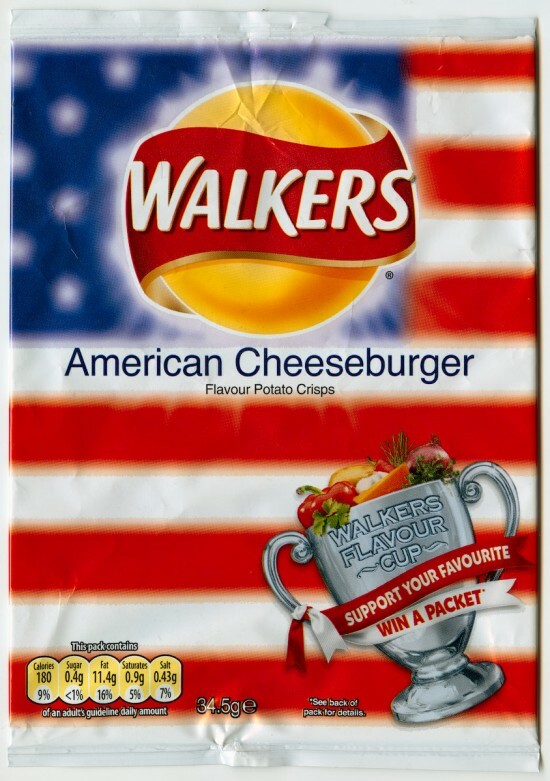 To kick off this leg of the series, we’ll begin with American Cheeseburger Flavour. Seriously, I haven’t got a clue what’s going on in that flavour lab – but this is by far the most authentic taste I have ever had. Not the taste of potato of course, but of real cheeseburger. If you ever had Johnny Rocket’s burgers in the US, this is what it tastes like. Even though Julia disagrees, for me this one gets 47 thumbs up for authenticity. Which isn’t to say that this is what I want out of a crisp all the time. can you still buy the American cheeseburger flavour ? they were the best crisps I have ever tasted . No, I think that ship has sailed. Shame they didn’t make it into a lasting flavour isn’t it? I’m kind of glad that Fish and Chips flavour is gone though… and the eggy breakfast flavour, that wasn’t such a success either in my opinion. Do you know of a place online that I can buy those. Those chips are one of the most American, non Amarican thing I have ever seen (other than glow in the dark “presidential” Obama toilet paper from China). I doubt these are still in production, I believe they were part of a limited edition run some years ago. It sounds crazy, but you may find a packet or two on eBay or Amazon.